It’ll park and drive itself. It’ll get to know you and your preferences. What’s unknown is whether it’ll make it to mass production. 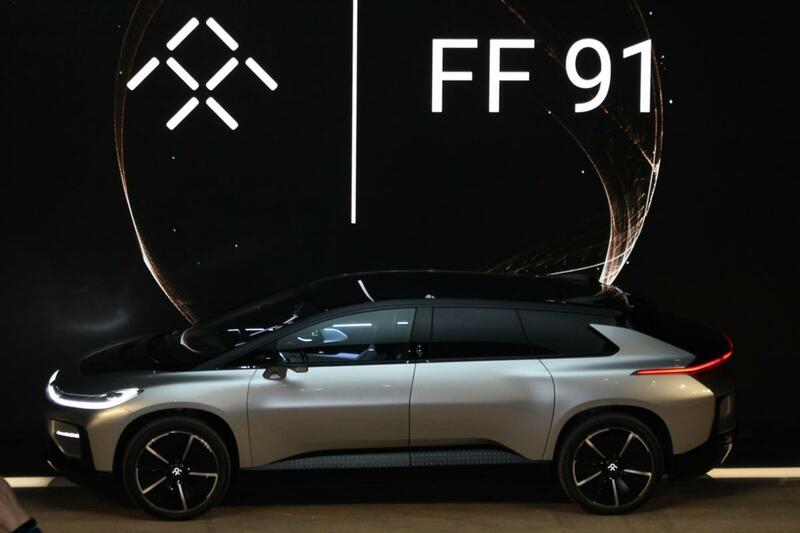 Faraday Future unveiled the FF 91, its first production EV, at CES in Las Vegas Tuesday night. Unlike the fantasy racecar at last year’s show, the FF 91 (pronounced “nine-one”) actually moved and drove—drove itself, parked itself, and did 0-60 in 2.39 seconds live onstage (with a driver). Also unlike last year’s car, Faraday has plans for the FF 91, including the production of 300 limited editions in March and mass production sometime in 2018. What was like last year’s show was the raft of big promises. The FF 91 is “the first of a new species,” said Nick Sampson, senior vice president of R&D and engineering. Sampson and other Faraday Future presenters heralded the FF 91’s unparalleled intelligence, cutting-edge design, fast charging, and pure, raw speed. 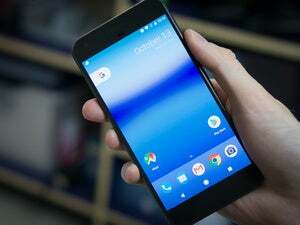 They even promised a mobility ecosystem where the car would provide connectivity, convenience, and customization to enhance the user’s driving experience. The interior of Faraday Future’s FF 91 is designed to be luxurious, and customizable to the driver’s and passengers’ needs. That’s big talk from a company with known financial troubles, underscored by a recent, steady stream of executive departures. Key players remain, like Sampson and Richard Kim, the vice president of design. Still, it’s hard to know what FF can realistically accomplish in a still-volatile EV market. Consider that Tesla, a far more established EV company, still struggles with financial and production problems. Faraday Future’s job on Tuesday night was simply to prove it has something real. It started by showing how the FF 91 could park itself, which it did live in the lot outside of the press conference. 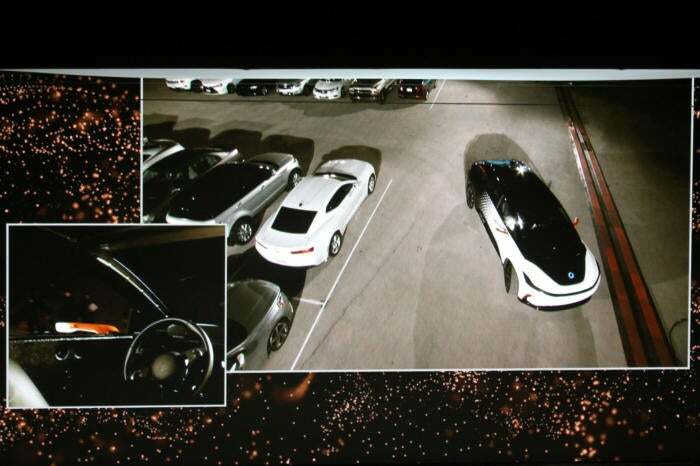 The demo had its hiccups: The car took a long time to find the free spot, and as with other automated parking systems we’ve seen, it had to drive itself all the way past the parking spot to see it as empty, whereas humans can see the spot ahead and go straight into it. 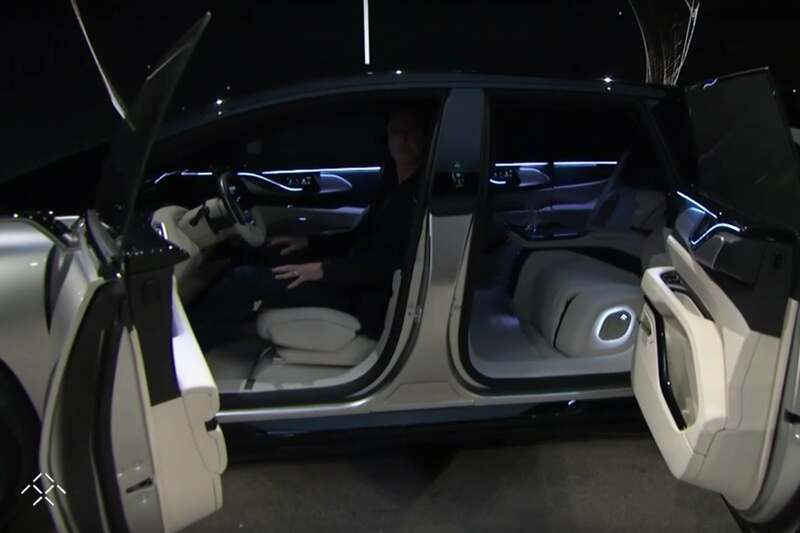 Faraday Future showed off the automated parking feature on the FF 91. The FF 91 can drive itself because it contains a raft of sensing technology, far more than I’ve seen on any other self-driving car prototype: 10 front- and rear-facing cameras; 13 long- and short-range radars; 12 ultrasonic sensors; and one high-definition 3D LiDAR. That LiDAR is distinctive for being integrated into the hood of the FF 91. 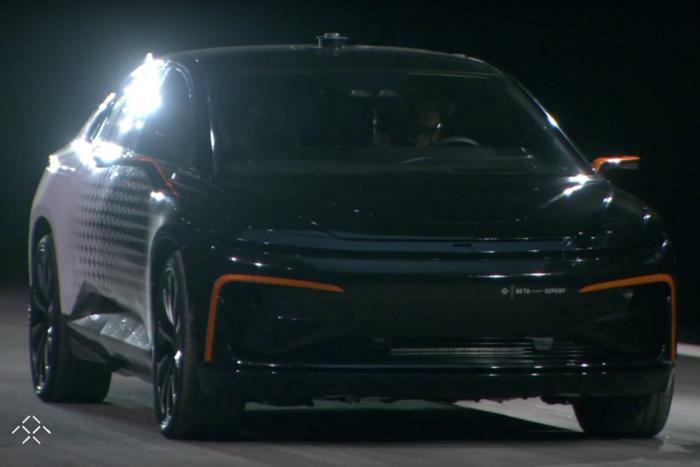 Where other automakers are trying to hide this bulky component, Faraday Future gave its LiDAR a glowing blue circle to show when it’s operating, and it can also rise out of the hood like a high-tech periscope. After its parking adventure, the FF 91 drove itself onto the stage, with Vice President of Propulsion Engineering Peter Savagian riding in the driver’s seat. 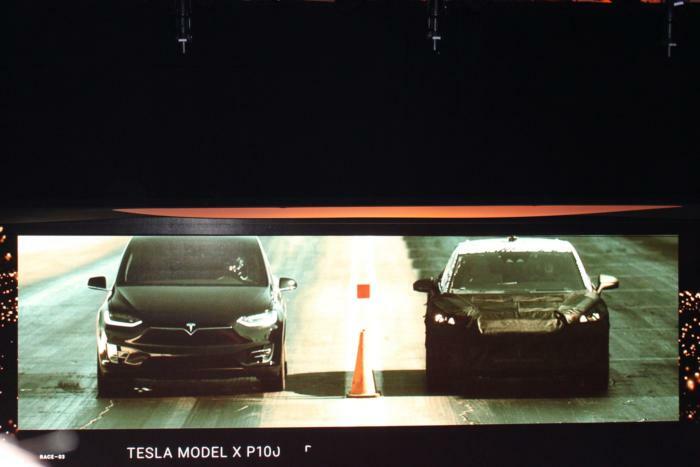 Faraday Future tested the acceleration of its FF 91 against the Tesla Model X (shown) and other prominent competitors. Savagian got to show the sizzle. He started with videos of 0-60 acceleration tests that pitted the FF 91 against Tesla, Ferrari, and Bentley competitors. All EV fans know that one of the joys of the technology is the instant torque that shoves you back in your seat while traditional transmissions are still working their way through the gears. Guess what: The FF 91 smoked them all. To underscore the results, Savagian trotted out all the competitors to repeat their 0-60 acceleration tests live onstage. As each car shot away, Savagian took swipes at all the noise and smell from the Ferrari and Bentley’s internal combustion engines, compared to the swift, yet silent Tesla and Faraday Future cars. The FF 91 smoked them all again, though by a mere hundredths of a second over the Tesla Model S 100D. Faraday Future’s CES press conference included live acceleration tests from Ferrari, Tesla, and Bentley automobiles, as well as its FF 91. Okay, so the car can move. The next step is to make more of them. Faraday Future is starting with a splashy soft launch, where it will sell 300 limited editions of the FF 91 in March—yes, just two months away. The company will also assert its environmental friendliness by donating part of the profit from the limited edition to an environmental group yet to be named, and auctioning off an FF 91 for the direct benefit of that group. 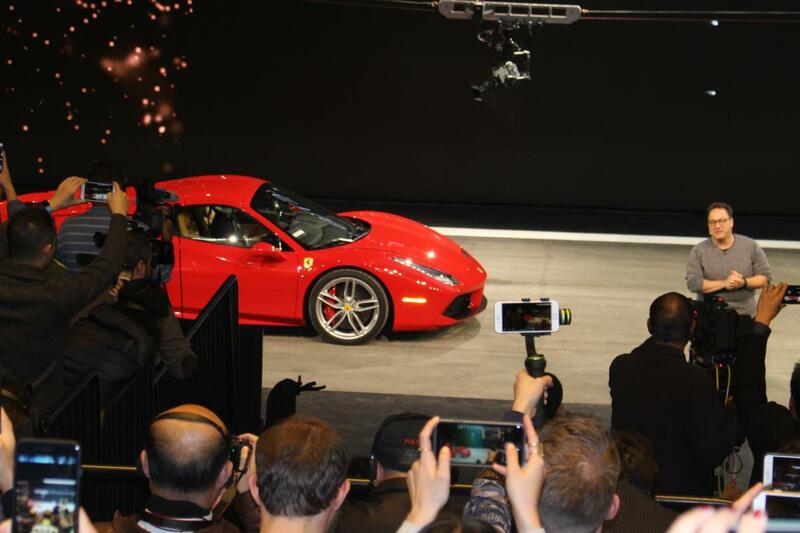 Making 300 cars is a good start, but it’s another thing altogether to mass-produce thousands. Faraday Future said it would start doing that sometime in 2018, and it opened reservations for those cars Tuesday night. All you have to do is plunk down $5,000 (refundable) to get in line for the FF 91. Faraday Future’s FF 91 is shown as it prepares to accelerate from 0 to 60 in less than 2.4 seconds. The fact that this deposit is five times bigger than the $1,000 deposit for the Tesla Model 3 doesn’t mean the FF 91 will cost five times as much in total—Faraday Future actually hasn’t set a price yet, though given all the technology, it will likely be expensive. The higher deposit does suggest that Faraday Future is looking for serious and well-heeled buyers. If you want one of the special limited editions coming in March, you’ll need to upgrade that reservation deposit by an unspecified amount.